Junque 'N My Trunk: I was featured! Whoot-Whoot!! 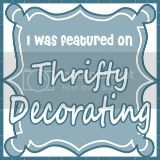 A big Thank You to "Thrifty Decorating" for featuring my "Magazine Rack Table", even though I couldn't get her link to stick until this week! Go check out her awesome blog!